Even though the healthcare industry considers retained surgical items to be events that should never occur under any circumstances, the problem persists throughout the United States. There is no standardized database to track the number of surgical items left in patients each year, but a number of researchers have tried to get a grasp on the size of the problem. About 95 percent of patients required extended hospitalization due to the retained surgical object. Emergency surgeries are nine times more likely to result in a retained surgical item case than a similar non-emergency procedure. Operating rooms, ambulatory surgery centers, labor and delivery rooms, and labs where invasive procedures such as catheters or colonoscopies were performed were the most common site of retained surgical items. According to the National Center for Biotechnology Information (NCBI), about two percent of retained surgical items cases result in fatal injuries. USA Today found that retained surgical items result in over $60,000 in added hospitalization costs, plus $100,000 to $200,000 in malpractice expenses. California is one of a handful of states seeking to reduce retained surgical items by fining hospitals who are found to have committed this error. From 2010 to 2013, the state fined hospitals a total of $1.8 million for 30 cases of retained sponges. 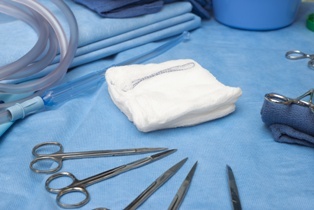 Malpractice cases in California’s Inland Empire involving retained surgical objects require skilled legal representation. Inland Empire Law Group's experienced California malpractice attorneys can help you build a successful claim by assessing the value of your case, documenting expenses, gathering evidence, and negotiating with the insurance company on your behalf. Call (888) 694-3529 to schedule an appointment at our Rancho Cucamonga location or our satellite office in Victorville.